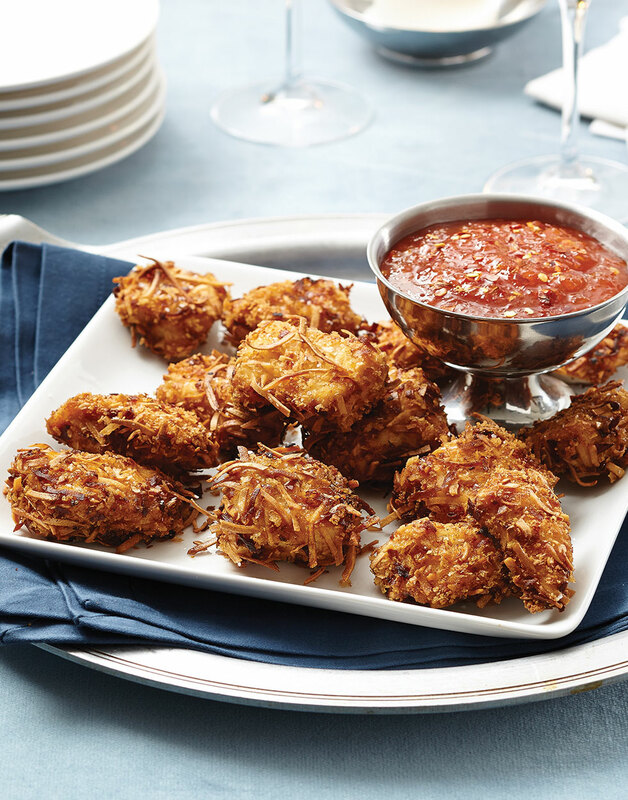 This recipe for Coconut Chicken Bites is totally worth celebrating. Meant to keep things nearly effortless — and sure to bring cheer to every hostess — these nuggets are a perfect year-round appetizer option. Crispy, crunchy, and sweet, it wins the trifecta of textures and flavors, too. Be sure to use unsweetened coconut for coating the chicken. Sweetened varieties are much more likely to burn while frying. For the chicken, combine cornstarch, 1 tsp. salt, and cayenne in a plastic bag. Pour coconut milk into a bowl. Combine coconut, panko, and remaining 1 tsp. salt in a shallow dish. Coat chicken chunks in cornstarch mixture, then in coconut milk. Dredge chicken chunks in coconut-panko mixture; transfer chicken to a wire rack set over a baking sheet. Chill chicken chunks until ready to fry, up to 2 hours. Heat ½ inch oil to 350° in a large sauté pan over medium. Fry chicken chunks in batches until golden, 2–3 minutes per side; drain on a paper-towel-lined plate. For the sauce, purée bell peppers, sugar, vinegar, ginger, and pepper flakes in a food processor or blender; transfer to a saucepan and simmer over medium heat, 4–5 minutes. Combine cornstarch and water; whisk sauce and simmer until thickened, about 2 minutes. Season sauce with salt; chill before serving.